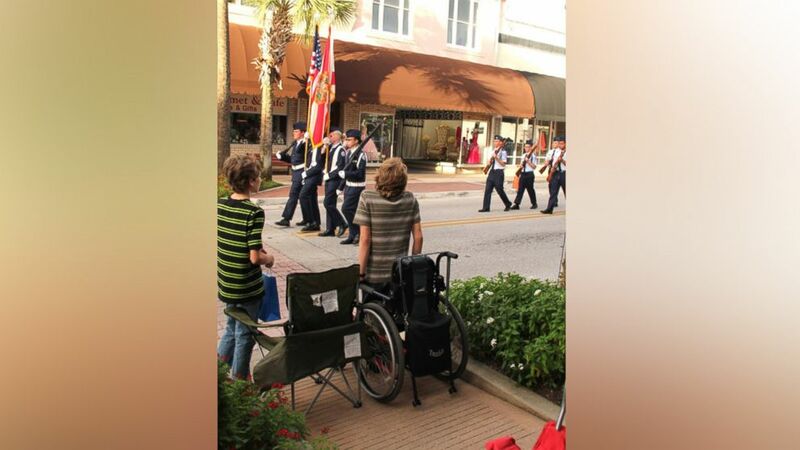 The Florida teen with spina bifida rose at the sight of an American flag. camera (Courtesy Myron Leggett) Arek Trenholm is wheelchair-bound but hoisted himself up to stand for the American flag. Arek Trenholm was born with a condition called spina bifida, which impairs the development of the spinal cord. The 16-year-old has been wheelchair-bound for 10 years now. But at the sight of the red, white and blue, he hoisted himself up to pay homage. (Courtesy Myron Leggett) Arek and his family were watching the local high school's homecoming parade when flag-wielding ROTC members marched by. 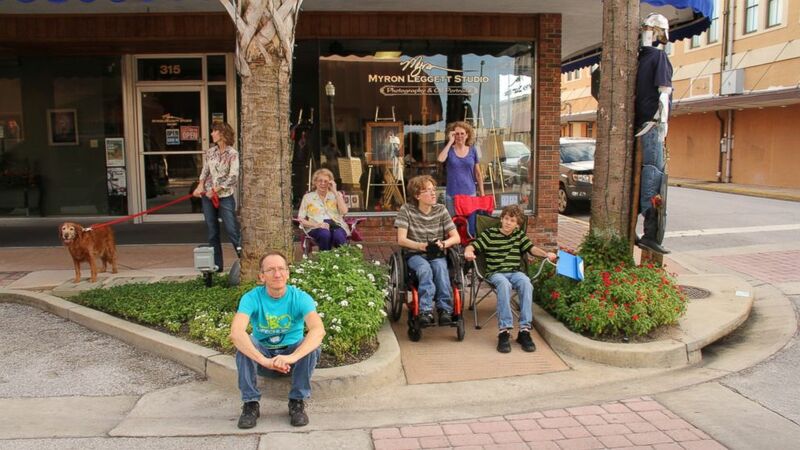 The teen and his family were outside his uncle Myron Leggett’s photography studio in Leesburg, Florida to watch a high school homecoming parade. It was when the junior ROTC marched by with the American flag that he used his arms to rise up out of his wheelchair. Leggett, a professional photographer, was the one to capture the moment. "My sister just called out, 'He’s standing!' And instantly, I knew what he was doing," Leggett told ABC News. Arek is known in his family as the young patriot. His mother, Deree Trenholm, said that despite his disability, he’s been standing for national anthems, pledges and flags since he was very young. She said he always chooses leg braces with the American flag on them. He now has 10 pairs. 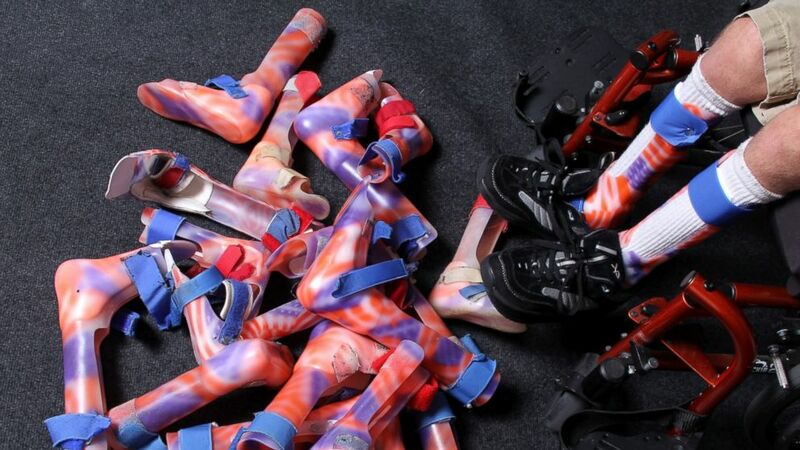 (Courtesy Myron Leggett) Arek has 10 pairs of leg braces, all decorated with the American flag. Leggett posted the photo to his Facebook and received many comments applauding Arek for his show of respect. "He didn’t have to do that. He has an excuse to stay seated," said Leggett. "Nobody told him, nobody encouraged him and he did it on his own. I admire him for that and I’m very proud of him." Arek’s mother hopes his picture will spread awareness about the spinal disorder for National Spina Bifida Awareness month, which is this month.